No apologies for mentioning them again. The Midland Jazz Connection were at the Test Match in West Bridgford last night, and the music again oused quality throughout the evening. The MJC were again led by Paul Ricard, and the trio this time included Paul on piano, with Andy Wilson on guitar, and Mal Trott on saxophone. I have to say that of the many songs played, the trio's rendition of the classic "Autumn Leaves" was particularly beautiful, with the three instruments blending perfectly together. Having spoken about the piano playing before, I thought that this time I would simply mention the saxophone. 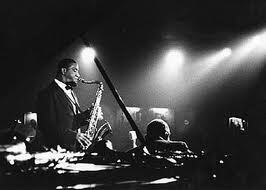 We were told that Mal was a great fan of Sonny Rollins, and anyone who has listened to recordings of Rollins will have no difficulty in detecting his influence. I can give no higher compliment than that. Mal had a great stage presence which compelled you to look and listen. I found the following recording of the Harry Brown Quartet playing on the old Pebble Mill at One BBC programme in 1982. I hope that the Mal Trott on saxophone is the same Mal Trott from last night, or I'll feel really stupid, and have egg all over my face. Most of us look quite different now to how we looked nearly twenty years ago. However, I will proceed with confidence, and say that they are one and the same, until someone tells me differently. Don't let the slight interference at the start put you off. The Test Match don't seem to advertise their jazz programme very well, so I'll do it for them in relation to the Midland Jazz Connection. Paul does a solo session on the first Thursday evening of every month, and the MJC are there every second Thursday of every month. Simple isn't it? I look forward to January 2012. While we're on the subject of music, I've just come across a Nottinghamshire group that is blowing my mind away, and I can't wait to hear them live. They are called Maniere des Bohemiens, which according to the 'LeftLion' magazine (issue 44) means "Manner of the Gypsies". 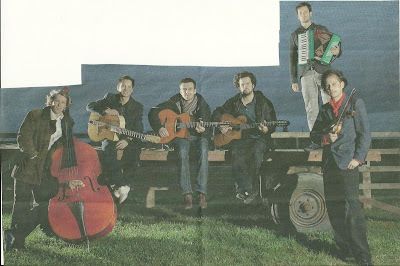 Their style is described as "Infectious, rapturous, blindingly improvised Romany swing music". They acknowledge the influence of Django Reinhardt, and as I've been listening to his music for years, you can certainly see that influence in their playing. I'm very glad to see this gypsy jazz-style music alive and well in Nottingham. The clip below gives a flavour of their music, and I hope that you enjoy it as much as I do. It's a live gig at Nottingham Contemporary in May 2011. What is it about art? "There is nothing for young people to do".